Canada’s Air Force announced yesterday the appointment of well-known /A\ NEWS BARRIE broadcast journalist and weather specialist, Bob McIntyre, as the first Honorary Colonel of the Academy. An investiture ceremony formalizing the prestigious appointment will be held on Friday, August 20 at 10 a.m. The ceremony takes place at Canadian Forces Base Borden (Building S-136, south side of base, 90 Rafah Cres.). Media are welcome to attend the event. “It is a great honour for me to serve as an Honorary Colonel to Canada’s Air Force,” said McIntyre. I find it quite ironic that a kid who was kicked out of high school and found refuge in the Air Force has been asked to be the first Honourary Colonel of a school, Base Borden’s Air Command Academy. I know my mom and dad would be very proud of their boy”. A broadcaster since 1966. McIntyre started in radio at CFJR in Brockville. He moved to Hamilton radio CHAM in 1970, and then became newscaster and news director for Toronto radio station CKFH. McIntyre became CKVR’s news anchor in 1972, followed by news director, manager of news & public affairs of CKVR. In 1983, McIntyre was named Weather Specialist. In 2002, McIntyre received the Dave Rogers Award from Canada’s Radio and Television News Directors’ Association for best feature of the year for “Bob’s Story: Life with Cancer”. McIntyre has flown with Canada’s Snowbirds five times and is an Honorary Snowbird pilot. He’s been flying since 2005 and while coming late to the game he currently flies a British 1943 Tiger Moth open cockpit bi-plane 82-A for the Edenvale Classic Aircraft Foundation. It has no brakes! The Tiger Moth was the same type of plane Bob’s father flew beginning in 1939. McIntyre’s father was a WWII flight instructor. “Pretty cool to fly a plane that your dad taught hundreds of kids to fly 70 years ago”. said McIntyre. Within Canada’s Air Force, the tradition of nominating unit honorary colonels goes back to 1970. Honorary colonels come from a diverse range of backgrounds, including many well-known public and community figures. They work behind the scene in an honorary and advisory role, providing a connection between the community and the Canadian Forces. A unit of 16 Wing Borden, the Air Command Academy provides professional development and general military training to Non-commissioned members by broadening awareness of Air Force heritage and developing general service knowledge and professional attributes. As if the balloon boy hoax hasn’t already become juicy enough, the story is still developing. The balloon boy situation, which was rumored to be a hoax by the public, received further ammunition this morning with the local police enforcement department revealed that they have found evidence that has lead them to believe that the balloon boy stunt was a hoax, including, an examination of the vessel that proved it never could have held the weight of 6-year old Falcon Henee. To add to the drama, now, law enforcement believes that a certain reality TV company just might have conspired with the family to create this media hoax in order to give the family a TV show deal. If evidence is found to confirm this allegation, then this reality TV company might also face charges similar to the Henee family. Not to say I told you so, but there were some skeptics that this was a hoax both before and after Falcon’s big announcement on CNN, but now, I think there’s no question that there was no truth to the story and it just keeps getting better now! Runaway Balloon Boy: All A Publicity Stunt? If you didn’t hear the story of the Colorado six year old who had all North Americans holding their breath as he was allegedly floating along in a helium balloon created by his storm chaser parents as a scientific research rool, you must be living in a hole. 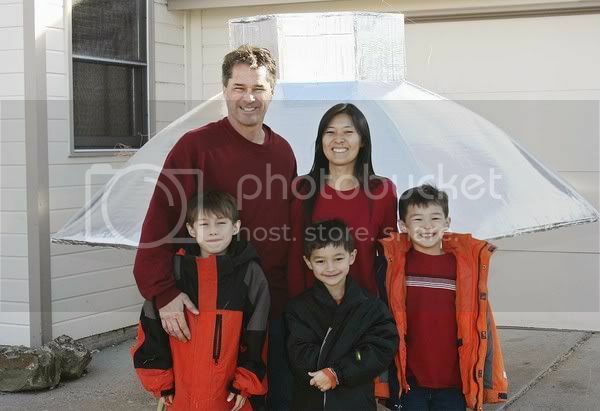 But while all major media outlets were focused upon tracking this jiffy pop look-alike balloon is it travelled across Colorado for more than 2 1/2 hours at 40 miles per hour, before it’s final landing in an empty field, the little boy was in fact safe at home. The family now claims, that after being yelled at by his father that morning, the 6 year old went to go and hide in the attic above the garage, they also claim that one of the boy’s brothers saw him get into the aircraft before it began to float away. There are a lot of blanks that have yet to be filled in; like why children were allowed to play around a potentially dangerous but also crucial piece of research equipment used in the parent’s work, and why the kid never surfaced in the few hours that half the world was watching rescue efforts take place to bring him home safetly. We might never have all of these questions answered honestly, despite our curiosity, but there’s one thing we do know – this smells suspiciously like a PR stunt. The parents got their taste of celebrity appearing on the show “Wife Swap” on two occasions, and posting videos on CNN relating to their storm chasing research; perhaps they weren’t ready to let go of their 15 minutes of fame and decided to get some more publicity for their business. It does seem a little bit fishy that flying balloon automatically equated to child on boardl but maybe we can just give them the benefit of the doubt, maybe they were just so panicked at the possibility that they never thoroughly searched their home. You can call me a pessimist, but I can’t help but buy into the PR angle to some degree, afterall, with an invitation to Larry King Live tonight, they’ve found themselves in the forefront of the news and have really got people talking whether it’s out of compassion or outrage. For those tuning into Michael Jackson’s memorial, airing live today on many television stations in Canada in the United States; here’s a run down of what you can expect in terms of a timeline while the world celebrates the life and death of one of music’s biggest legends. 09.33 LA (17.33 GMT): Jackson’s gold coffin will serve as the centrepiece on the stage of the Staples Centre memorial, according to Sky News. 09.29 LA (17.29 GMT): The Staples Centre ceremony will have Mariah Carey singing “I’ll be there” as the first solo performance, according to Geoff Boucher, on the latimesJM Twitter feed . 09.29 LA (17.29 GMT): So far, Jackson’s mother Katherine, with Jackson’s three children, Prince Michael I, Paris and Prince Michael II (also known as Blanket) have been seen leaving the Forest Lawn Cemetery. Jackson’s sister LaToya was also spotted from the aerial coverage. The hearse and family motorcade are now driving about 7 miles to the Staples Center. 09.25 LA (17.25 GMT): The crowd has been building in the streets along the cortege route since people learnt that Michael Jackson’s body would be moved to Staples Centre for the memorial service. 09.14 LA (17.14 GMT): Michael Jackson’s family has left Forest Lawn and is now heading to the public memorial. 09.08 LA (17.08 GMT): Fans entering the Staples Centre are paying tribute to Jackson by dressing as characters from his greatest hits. RT@writerchica reports on Twitter that two ‘Billie Jean’-style fans had been spotted, along with one dressed as MJ in ‘Beat it’. 09.04 LA (17.04 GMT): In a sign of the King of Pop’s influence around the world, many European broadcasters are clearing their schedules tonight to broadcast the memorial, according to a report in Variety . 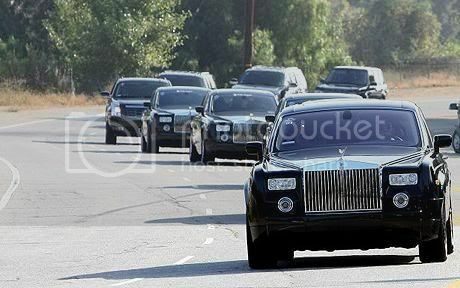 09.02 Los Angeles (17.02 GMT): Michael Jackson’s casket will be driven from Forest Lawn to the Staples Centre. “It wouldn’t be fair for the fans who are going to appear and be here at the Staples Centre not to see his casket,” Teddy Riley, a singer who worked closely with Jackson on several albums, told CNN . 09.00 Los Angeles (17.00 GMT): Jackson’s gold casket is wheeled out of the Forest Lawn funeral home and loaded into a hearse. It appears that the casket will be brought to the memorial serivce. 08.58 Los Angeles (16.58 GMT): LA police have asked fans without tickets to the memorial service to stay home from the event. 08.55 Los Angeles (16.55 GMT): Because the Jackson family was late to arrive at the funeral home, there are suggestions that the memorial service will be delayed. 08.54 Los Angeles (16.54 GMT): Last week after news of Jackson’s death stunned his fans, three of his albums became the best-selling albums in the US. “Number Ones” sold 108,000, “The Essential Michael Jackson” sold 102,000 and “Thriller” — which was reissued last year in multiple commemorative versions — sold 101,000, according to preliminary sales data from Nielsen SoundScan. 415,000 Michael Jackson albums were sold in the US last week. The week before he died, he sold only 10,000, making last week’s sales 40 per cent more than Jackson’s entire catalog had sold for the year up to June 21, Billboard numbers showed. 2.6 million songs by Michael Jackson as a solo artist or performing with the Jackson 5 were downloaded online, up until last Sunday. 08.51 Los Angeles (16.51 GMT):One of CNN’s reporters, who is inside the Staples Centre, site of the public memorial, has his hands on a show programme. The booklet is gold, and filled with pictures of Jackson posing with various celebrities and political figures. 08.49 Los Angeles (16.49 GMT):The family’s private ceremony is taking place at Forest Lawn, a cemetery in Los Angeles with views of the Hollywood Hills. Many Hollywood stars are buried here, including Bette Davis and David Carradine, the recently deceased actor. 08.44 Los Angeles (16.44 GMT): Jackson fans across America who were unable to obtain tickets to the Staples Centre memorial can watch the service in Cinedigm cinemas across the US, according to the New York Times . 08.39 Los Angeles (16.39 GMT): The Staples Center has just opened its doors to the fans and mourners. 08.39 Los Angeles (16.39 GMT): Watch here for live news feeds of the scenes outside the Staples Centre, and the Forest Lawn cemetery. 08.37 Los Angeles (16.37 GMT):The service at Forest Lawn is now underway. Reports say that Jackson’s coffin will be placed on the stage at the Staples Center throughout the memorial concert. 08.36 Los Angeles (16.36 GMT): LaToya Jackson was seen entering the cemetery before the doors were closed for the private ceremony. 08.35 Los Angeles (16.34 GMT): Michael Jackson’s mother, Katherine, and other family members have entered the Hall of Liberty at the Forest Lawn cemetery in Los Angeles. There is seating here for at least 1000 people. Toronto, ON (November 6, 2008) – With just five days to go before THE 2008 SCOTIABANK GILLER PRIZE, CTV and Bravo! announced today additional details including the line-up of presenters that will participate in the most-anticipated Canadian literary broadcast of the year. A celebratory black-tie affair, THE 2008 SCOTIABANK GILLER PRIZE is broadcast live directly from the ballroom of Toronto’s Four Seasons Hotel on Tuesday, November 11 at 9 p.m. ET on Bravo! and online on the CTV Video Player at giller.CTV.ca. As the winner makes headlines across the country, CTV presents the broadcast again on Wednesday, November 12 at 10 a.m. ET and 2 p.m. ET and Saturday, November 15 at 5 p.m. ET on CTV (visit ctv.ca and bravo.ca to confirm local broadcast times). Hosted by CANADA AM’s Seamus O’Regan, the one-hour broadcast features an eclectic group of presenters who will introduce each shortlisted book, including Alice Munro, Dr. Vincent Lam, Rex Harrington, Allan Hawco and Dr. Samantha Nutt. Attending the gala are a who’s who of Canada’s literary and publishing community. To help celebrate the 15th anniversary of the Scotiabank Giller Prize, nine previous winners are expected to attend, including Elizabeth Hay (2007), presenter Dr. Vincent Lam (2006), Alice Munro (2004), two-time winner M.G. Vassanji (2003/1994), Austin Clarke (2002), Richard B. Wright (2001), Michael Ondaatje (2000), juror Margaret Atwood (1996) and Bonnie Burnard (1999). The live presentation of THE SCOTIABANK GILLER PRIZE will feature highlight reels and interviews filmed in the Canadian locations the finalists hold most dear to them: Mary Swan in Guelph, ON; Anthony De Sa in Toronto’s Portuguese district; Marina Endicott in her hometown of Cochrane, AB; avid outdoorsman Joseph Boyden fishing in Banff, AB; and a visit with Rawi Hage in his adopted hometown of Montreal. Additionally, a highlight video to be played takes a look back at past Giller moments in celebration of the Prize’s 15th Anniversary. Throughout the broadcast, each finalist and their book will be introduced by an esteemed group of presenters. Two-time Scotiabank Giller Prize-winning author and living legend Alice Munro will present finalist Mary Swan’s The Boys in the Trees. Munro was once Swan’s teacher and mentor. 2006 Scotiabank Giller Prize-winning author and doctor Vincent Lam – a great admirer of finalist Joseph Boyden – will introduce Boyden’s novel, Through Black Spruce. Rex Harrington, artist-in-residence for The National Ballet of Canada and guest judge on SO YOU THINK YOU CAN DANCE CANADA, brings his love of the written word to his introduction of finalist Anthony De Sa’s Barnacle Love. Canadian actor and co-founder of The Company Theatre, Allan Hawco, will introduce former theatre actor, director and 2008 Giller finalist Marina Endicott’s book, Good to A Fault. Founder and Executive Director of War Child Canada, Dr. Samantha Nutt, will introduce finalist Rawi Hage’s Cockroach. Nutt’s experiences dealing with the impact of war provides insight to the struggles of the characters in Cockroach, and in author Hage’s own life; he lived through nine years of civil war in Lebanon before immigrating to Canada. At the end of the broadcast, Giller Prize founder Jack Rabinovitch will accept the envelope from the three-person judging panel and announce the 2008 winner of THE SCOTIABANK GILLER PRIZE. As the national broadcaster of THE SCOTIABANK GILLER PRIZE for the fourth consecutive year, CTV’s family of channels – including Bravo!, BookTelevision, Star! and CP24 – support the event with unprecedented programming on their news and entertainment properties. On Tuesday, November 11, the morning of the big event, viewers can preview THE 2008 SCOTIABANK GILLER PRIZE broadcast with a sneak peek of the awards ceremony on CANADA AM. Then, on Wednesday, November 12, the morning after the ceremony, CANADA AM features an interview with the Giller Prize winner live, in studio. On awards night itself, ETALK’s Lainey dishes about the A-list attendees at the hot literary event before The Scotiabank Giller Prize is handed out. On Wednesday, November 12 at 7 p.m. ET (check local listings), ETALK will feature highlights from the Gala Ceremony at the Four Seasons Hotel in Toronto. On Saturday, November 22 at 6 p.m. ET, ARTS & MINDS, Bravo!’s weekly half-hour arts magazine, wraps up THE 2008 SCOTIABANK GILLER PRIZE broadcast with an in-depth segment about the prize, the ceremony and the newly crowned winner. Additionally, CTV’s online presence includes expanded coverage at its dedicated Scotiabank Giller Prize website, giller.ctv.ca, including author bios, excerpts from the shortlisted books, interviews, videos and more. The gala will be streamed to readers around the world on CTV.ca, via the giller.ctv.ca website, and will also be available on demand on the CTV Video Player at CTV.ca immediately following the broadcast. These five finalists were shortlisted by a respected judging panel comprised of award-winning author Margaret Atwood; Liberal MP, Foreign Affairs critic and author Bob Rae; and renowned international journalist, professor and author Colm Toibin, all of whom will be in attendance at the gala. The winner of this year’s Scotiabank Giller Prize is awarded $50,000, while each finalist receives $5,000. A review of the latest audience figures from BBM Nielsen Media Canada confirms that CTV has Canada’s most-watched programs this winter by an overwhelming margin in total viewers and key demos. Led by ratings juggernaut American Idol, CTV claims 10 out of the Top 10 continuing programs airing during the Winter Season (Dec. 17-Feb. 3) among total viewers. Additionally, CTV has nine out of the Top 10 programs on Canadian television among A25-54 and eight out of the Top 10 programs among A18-49. Winter’s No. 1 hit show, American Idol, leads the charge, averaging nearly three million viewers since its debut on Jan. 15. Fan favourite Lost returns to the Top 10 (#7) with 1.837 million viewers as does all-new Law & Order (#6, 1.839 million), with new cast members Jeremy Sisto and Linus Roache. CTV’s The Moment of Truth is the only brand new series on Canadian television to crack the Top 10 (#9, 1.6 million). When looking at the Top 20 shows on Canadian television, CTV delivers 16 out of 20 among total viewers (up from 15 in ‘06/07), 16 out of 20 among A25-54 (up from 14 in ‘06/07) and 15 out of 20 among A18-49 (up from 12 in ‘06/07). New drama series Eli Stone lands at #17 with 1.2 million viewers while all-new episodes of Medium returns the series to the Top 20 at #13 (1.339 million viewers). Corner Gas (#18, 1.2 million) remains the only Canadian series in the Top 20. *Source: Preliminary overnight data, CTV Full and Global Full (BBM Nielsen Media Research). Note: Rankings based on continuing series currently scheduled. Series removed from this ranking include Desperate Housewives, Grey’s Anatomy and The Amazing Race. Canadians across the country overwhelmingly believe that the country’s justice system is too lenient on repeat offenders, a new poll released today by CTV and The Strategic Counsel reveals. As the third anniversary of the Mayerthorpe tragedy approaches, the issues surrounding the horrible event continue to engage the nation. The poll indicates that nationally, three in four people surveyed (75 per cent) agree that the Canadian justice system is too lenient on repeat offenders, with 50 per cent saying the justice system is “much too lenient.” Only five per cent felt that felt it was “not at all lenient.” Canadians also strongly indicated they want to see major changes with respect to how violent offenders are dealt with in this country. An extraordinary 72 per cent of respondents support adopting a hard-line “three strikes and you’re out” rule, similar to that practiced in the United States, in which a person found guilty of three violent crimes receives mandatory life imprisonment without the possibility of parole. Only 21 per cent opposed such a policy. Q. Is the Canadian justice system too lenient when it comes to its treatment of repeat offenders or individuals with multiple criminal convictions? 76% of women and 73% of men said yes. 78% aged 30-49, 77% aged 50+ and 62% aged 18-29 said yes. Among regions, the strongest response came from residents of Alberta, where the Mayerthorpe tragedy occurred, with a whopping 83% responding that the Canadian justice system is too lenient on repeat offenders. Agreeing were respondents in Atlantic Canada and Manitoba/Saskatchewan (80%), Ontario (77%), British Columbia (74%) and Quebec (64%). Q. Should Canada adopt a “three strikes” rule, similar to that seen in the United States, in which an individual convicted of three violent felonies receives mandatory life imprisonment without the possibility of parole? 74% of women and 71% of men said yes. 75% aged 30-49, 71% aged 50+ and 69% aged 18-29 said yes. Among regions, the strongest response came yet again from Alberta, with 80% of respondents saying they were in support of such a rule. Support for the proposal was also received by respondents from Atlantic Canada (79%), Quebec (78%), Manitoba/Saskatchewan (75%), British Columbia (67%) and Ontario (66%). “These findings provide a crystal clear perspective that Canadians want tough measures taken against criminals, particularly repeat offenders,” said Tim Woolstencroft, Managing Partner, The Strategic Counsel. CTV commissioned the poll to gauge current attitudes of Canadians towards repeat offenders in the community and the effectiveness of the Canadian justice system. The results of the poll are released in advance of the premiere of the CTV Original Movie Mayerthorpe, airing Sunday, February 10 at 9 p.m. ET (check CTV.ca for local listings). The movie is a testament to the strength and dedication of the families of four slain RCMP officers who lost their lives at the hands of heavily-armed, habitual criminal James Roszko, who ambushed them on his farm near Mayerthorpe, AB. Valuable input from family members during the process helped set the tone for the movie to be as accurate as possible, both historically and emotionally. Mayerthorpe is a chilling dramatization of the events leading up to March 3, 2005, when RCMP officers Anthony Gordon, 28, Leo Johnston, 32, Brock Myrol, 29 and Peter Schiemann, 29 were murdered by James Rozko. The horrifying event was the RCMP’s greatest loss of life in a single day and left an entire country asking “why”? As the three-year anniversary of the tragedy nears, the question still remains. “Mayerthorpe is both a poignant tribute to the RCMP officers who died that day as well as a complex portrait of a national tragedy. It will generate many questions that deserve to be answered,” said Susanne Boyce, President, Creative, Content and Channels, CTV Inc.
A CTV/ The Strategic Counsel Poll was conducted from January 31 to February 4, 2008. The findings are based on interviews conducted by telephone among a weighted national sample of 1000 adult Canadians 18 years of age or older. A sample of 1,000 yields a margin or error of +/- 3.1 percentage points. Note: Due to rounding, proportions may not total to exactly 100 per cent. The response was, much too lenient (50 per cent), somewhat lenient (25 per cent), not very lenient (12 per cent), or not at all lenient (five per cent). The second statement was “Should Canada adopt a “three strikes” rule, similar to that seen in the United States, in which an individual convicted of three violent felonies receives mandatory life imprisonment without the possibility of parole?” The response was strongly support (44 per cent), somewhat support (28 per cent), somewhat oppose (10 per cent), or strongly oppose (11 per cent). When business news breaks, Canadian investors turn to BNN – Business News Network for the latest reports. With the financial markets influx, Canadians turned to BNN.ca for the most comprehensive look at the economic crisis. Over the past two days, a record number of Canadians have used BNN’s online Video on Demand service at BNN.ca to watch more than 80,000 video business news clips. This is more than 35 per cent above the daily views average. From the minute markets opened, viewers were also accessing the Top Story on BNN.ca, finding out quickly what had happened in Tokyo, Hong Kong and the East, and what to expect for the rest of the market day. BNN continues to deliver up-to-the minute coverage on breaking market news and developments with the latest news reports and feature interviews available on demand at BNN.ca. Since its launch last year, BNN’s online Video on Demand service has become the most-watched Canadian business news service on the Internet. BNN – Business News Network (formerly Report on Business Television) is Canada’s only television service devoted exclusively to business and finance news with wall-to-wall coverage of the markets. The Network features the only televised stock ticker with real-time data from the TSX, NYSE and NASDAQ. BNN – Business News Network provides Canadian investors with the latest business news, newsmaker interviews and stock market analyses. The network is wholly owned by CTV Inc., a division of CTVglobemedia. Robert Hurst is President, CTV News. Jack Fleischmann is General Manager, BNN – Business News Network. TORONTO, June 24 /CNW/ – Canada’s No. 1 national newscast, CTV National News with Lloyd Robertson has just been named Canada’s Best Newscast by the Radio-Television News Directors Association (RTNDA). The award was presented tonight to Wendy Freeman, Vice President and Executive Producer, CTV News and Robert Hurst, President, CTV News, at the RTNDA’s National Awards Gala in Vancouver. The coveted award was just one of 10 RTNDA awards and one honorable mention for the CTV News Division – more than any other television broadcaster. For CTV National News with Lloyd Robertson, the Best Newscast award caps off another No. 1 year for CTV. BBM Nielsen audience numbers confirm that CTV National News with Lloyd Robertson is not just No. 1 in total viewers, but outperforms Global National and The National (CBC) in all key advertising demographics – Adults 18+, Adults 18-34, Adults 18-49 and Adults 25-54. For Robertson, the news rounds out another stellar year for Canada’s Most Trusted Anchor. He was recently named to Canada’s Walk of Fame, the first journalist ever inducted (June, 2007), and was named Canada’s most powerful anchor in news by TV Guide (April 2007). CTV, Canada’s largest private broadcaster, offers a wide range of quality news, sports, information, and entertainment programming. It has the number-one national newscast, CTV National News with Lloyd Robertson, and is the number-one choice for prime-time viewing. CTV owns 21 conventional television stations across Canada and has interests in 16 specialty channels, including the number-one Canadian specialty channel, TSN. CTV is owned by CTVglobemedia, Canada’s premier multi-media company. More information about CTV may be found on the company Web site at www.ctv.ca.